One of things I rarely talk about on this blog is my love for baking. This is a writer’s blog, after all, not a food blog. But writers need to eat, or more importantly snack. Snacks are a writer’s best friend. After a long hot summer when we keep the oven off as much as possible, I relish the arrival of autumn. It’s September, so pumpkins are abound, and yesterday me and my three wee ones (who are not all so wee any more) made pumpkin muffins. They are not only the best pumpkin muffin I’ve ever had, but quite possible the best muffins I’ve ever had! So, I just had to share this recipe with you! Click here to get it over at the Fresh Loaf, which I got via the The Kitchn (a terrific site I refer to often!). 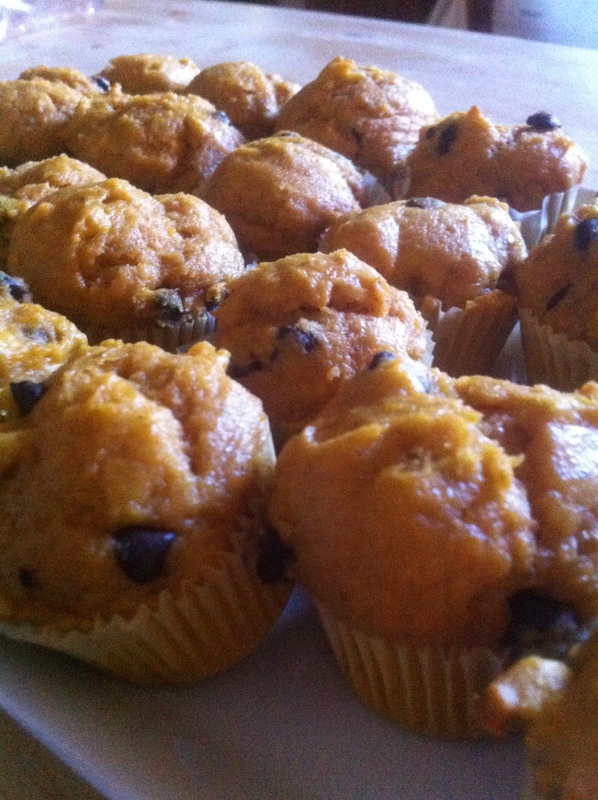 It’s a basic recipe of pumpkin puree, butter, cinnamon, nutmeg, eggs, chocolate chips. I used mini dark chocolate chips, and we made mini muffins, cause my kids are still mini, and they fit perfectly into snack boxes for school. Plus, they’re small enough that I can keeping snacking all day without feeling guilty. This one recipe made three trays of mini muffins and 6 small loaves. These turned out to be the perfect balance of spice and sweet, fluff and substance. And the house still smelled terrific this morning! Made it easy to begin the day! I hope these will keep your writer tummies full and warm so you can work during the season! One of the main questions I got asked was does this recipe really require chocolate. I’d say no, it doesn’t, but the flavours and textures go hand in hand, and now that I’ve had them with the chips I don’t think I’d go without (if you asked the kids they’d say absolutely, chocolate is necessary!). I put less than the recipe asked, and by using good quality dark chocolate I didn’t feel like any health choices were being compromised. For those of you wanting a classic pumpking muffins, I’d recommend this one. Just made it last night, and if you let the muffins sit overnight the flavours really pull through and come out for a delicious moist muffin. Enjoy! Next Anytime, anywhere, anyplace, read! There is ABSOLUTELY nothing wrong with discussing cooking/baking on a writer’s blog. Besides the fact that writers DO need to eat, it is also a creative outlet. Even the simplicity of a recipe like those pumpkin muffins (I can’t even write it without salivating) is a beauty and a joy. The act of baking, the waiting for the end product, the scent, the flavor. Your wee ones got a special treat indeed. This is the first steps toward a creative life. Even if there is not writing or sculpting or music to create, there is decorative plate and the smile of a satisfied face. I hit this at just the wrong moment. About to have a cup of tea. Now the tea seems very wet…. What a rotter! Now I’m hungry again!